Fresh off of last night's radio show I've been thinking about the roles of parents when it comes to video games and children. Scoot had discussed about how he believes that politicians and media outlets use violent video games as an easy scapegoat when it comes to the cause of violence, especially when it involves young people. His general consensus is that while video games don't really help people with people with personality problems they don't actively hurt people either. The idea that 10 year old Timmy is gonna go shoot up some place when he is older because he played Military Shooter #7264 is absurd. Perhaps Timmy shouldn't be playing a game like that at his age but that is a responsibility that lies with his parents. Show is over. Go to bread. In my 20 years on this earth I have been playing video games for alomst 17 of them. My memory is a bit hazy but I wanna say when I was 4 years old I had surgery on my left foot and ankle to correct a birth defect with one of the tendons. For a month or so after I was stuck in a cast and wasn't able to really do much. That time is what I remember as my earliest introduction to video games. My mother had a SNES (I don't remember if it was actually her's, if she had bought it for me, or if it might have been a hand-me-down from one of my cousins) and while I was stuck in the cast we took turns playing Yoshi's Island together. To this day I'm pretty sure it is the only video game she has ever actually beat. I had other games on the SNES such as Super Mario World, Mighty Morphin Power Rangers, and a fighting game that may or may not have been Killer Instinct. I was allowed to play these games in moderation. My parents would monitor the games I played and always checked the age rating whenever I asked for a new one, not that it mattered that much since I never really asked for games that were above E other than maybe Goldeneye 007, and would remind me that nothing in the games were actually real in addition to that my dad regularly beat into my head various common sense life rules that everyone should know. "A man never ever raises his hand to a woman", "Violence is never the answer to anything", "Don't talk to strangers." and other such things. My parents were strict but I felt very fair growing up. I didn't actually get a non-Nintendo until 2007 when my dad surprised me coming home one day with a PS3 that he bought to use as a Blu-Ray player. In addition to a few movies he had bought he picked up Call of Duty 4 and that became the first ever M rated game I owned. I got hooked on it and looked forward to it up until I eventually got sick of it around the time of MW3. Even with my parent's trust that I was responsible enough to play these violent games they didn't let up on the parenting. After I had my driving learner's permit for the required time my dad still didn't allow me to apply for a full license until I turned 18. During my junior year of high school one day my dad actually took me to the hospital to see someone. We went to the emergency room and he showed me to the door of a room that was being guarded by a police officer. Through the window I saw a man strapped to the bed freaking out of his mind. Dad told me that the man was someone who had been arrested while high on drugs (I don't remember which drug) and that he wanted to show me him so that I hopefully never end up the same way. I am now 20 years old and outside of one speeding ticket last year (which was my fault and a stupid mistake in judgement) I have been squeaky clean even with all the video games I have been playing. My 13 year old brother has been playing games like CoD too but as he has received the same parenting I did there doesn't seem to be anything wrong with him. I feel my parents did a good job with us and were responsible. That doesn't mean though that there isn't such a thing as too much parenting. My brother tells me about his friends whose parents are super extreme when it comes to monitoring all of the content they consume not just video games. I don't agree with the super extreme restriction parenting style as I feel it could cause kids to rebel later in life but it is nice to know that those parents are at least keeping tabs on their children. So did you grow up with video games? Were your parents strict raising you? 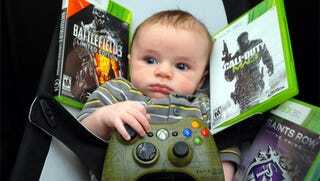 Maybe you're raising a kid in a world of video games. Let me know what you think when it comes to kids, parents, and video games.